All events in place Njivice ! Surface : 25 m2 (Ground floor). Characteristics: Near the beach, in the center, ideal for children, with terrace, with garden, suitable for pets. Environment: Garden with garden furniture, ability to use barbecue, parking provided, common garden, Common garden. Other options: Pets allowed, owner lives in the house or near the house, pleasant environment, One pet is allowed. Price options: Tourist tax is included. Check in: 14:00 pm, Check out: 10:00 am. Prices are the total price for building / apartment on the day. Included are: utility fees in regular ratio of consumption (electricity, water, gas), weekly change of sheets and cleaning. Pet: 15,00 € / day Registration is not included. It costs 3 EUR per person Pet price is charged separately. Final cleaning included in the price. The recent discovery of the pre-Romanesque baluster (pluteus - the wall panels, fence) uncovered the ancient roots Njivica.Do discovery baluster founding Njivica tied with the 1474th Njivice year when first mentioned in the deed of Krk Prince Frankopana that this document was part of his estate donated Nicholas Loncaric, both from him asking for a guarantee that they will take care of the St. Mary of the Nativity (today the Church of the Nativity of the Blessed Virgin Mary) and the service of God.Pluteus proved that Njivice incurred before 15 century. Specifically, pluteus originally belonged to the church, whose location is not known, but it is known that in this church shared space Presbytery of space vjernike.Na pluteus are four sections divided threefold ribbons in the first two, there is a motive dove and cross. The decorations on the pluteus typically Preromanesque so it is assumed that the church in which he originally stood pluteus also from that time (11th century).Moreover, the church had to be built somewhere near the present-day, as indicated by the recently discovered ancient finds from the surrounding area. This in turn suggests that Njivice and probably has ancient korijene.Plutej now kept in the parish church of the Nativity of the Blessed Virgin Mary in which it is exposed. .
Near Njivica (at the turn), you have the option of recreational jahanja.Kako for riders with experience and those without experience, with a guide in a confined space is also an opportunity to get to know one specific side of the island and the trees .. The ancient city, and early Christian complex in the bay near Sepen Njivica and Omisalj. 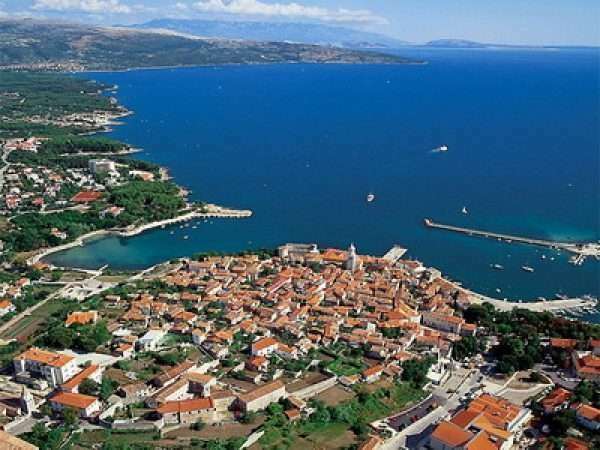 In Sepen bay on the island near Omišalj, was built in the first century AD The newly planned, the ancient Roman city Fulfinum for veterans Flavian emperors. Municipium Flavium Fulfinum realized by then uhodanoj urban scheme: the flat area the grid communications. Maritime suitable bays secured a well-protected harbor, a fertile field with an abundance of water surface of participation in the life of classical antiquity. City owned all the basic assumptions to this way of life, a forum with the Capitol and the city's basilica, port installations with commercial fourth by the sea, spa, communication with suburban cemeteries and two water phases. During the decline of ancient civilizations Fulfinum was probably one of the first casualties. Conceived as a top city civilization achievements, open and loving, sensitive to the least impact in the standard of urban life, which brings uncertainty of late antiquity, who welcomed her loch along with his anthropomorphic creator. However, as is the emergence and disappearance of a city, like people, have their own fate, he lost those reflections that are reflected in the metamorphosis of form and spirit, life continued in the design of new debris. On the outskirts of the ancient city, founded in the fifth century, the imposing early Christian complex (Mirine), which connects to the Benedictine abbey of Saint Nicholas.